We've seen some incredible work from artist Ken Taylor by way of his pieces produced for Mondo that have been released for films like Thor: The Dark World last year, Jurassic Park at the beginning of 2013 and Drive back in 2012. Now the masterful artists is getting his own Mondo gallery show at the collectible arthouse's location in Austin, Texas and will feature a whole slew of work inspired by many more movies we love, not to mention those that Mondo hasn't even highlighted with artwork yet. 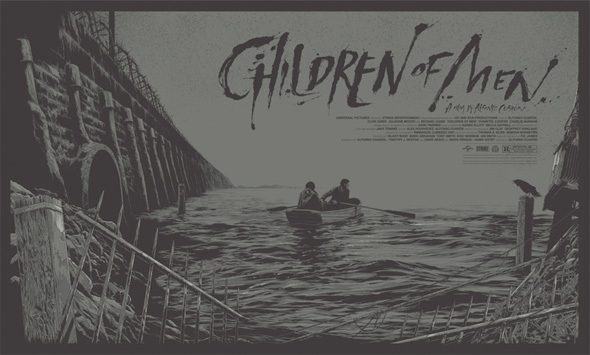 One such piece commemorates one of our favorite sci-fi films, Alfonso Cuaron's incredible Children of Men. Look now! The print is sized at 21.5″ x 36″ with editions of 375 for the regular gray edition and 200 for the variant in red. As for Taylor's show, Mondo presents “The Art of Ken Taylor” at their gallery in Austin, running from May 30th through June 21st. The opening night event will be Friday, May 30th from 7 – 10pm at the Mondo Gallery, located at 4115 Guadalupe St. in Austin, TX. Artist Ken Taylor will fly in from Australia and says, "Flying halfway across the world to exhibit my work for this amazing collector niche still blows my mind every day. This is the culmination of many months of hard work and stress (but more importantly, fun), and I can’t wait to show it all." Check out the rest of Taylor's previous Mondo work at their archives right here. Lovely. One of the greatest sci-fi films of all time.